The map to the right shows the dividing line between Virginia and North Carolina and this same line is shown in the map below. The map below is a Google map I created to show the location of the Williams family in early Virginia as well as the location of other relatives like the Kitchens, Philips, and Thomas families. Also shown are the location of several other early land owners as an aid in identifying the location of deed and land patents bearing their names. The map is interactive, providing the ability to click on a marker and read information about that marker. For example, click on one of the straight lines and a bubble will pop up identifying it as the border between two Virginia Counties. 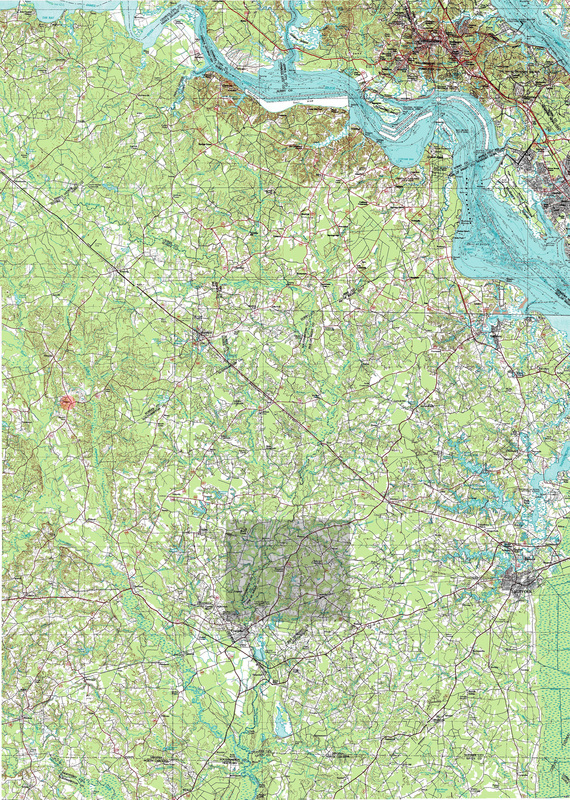 Click on the square outlined at the top of the map and a bubble will pop up identifying the source map for this area of Virginia. Yellow houses identify relatives. Green houses identify landowners who are not relatives. Red drops identify Williams shown on the 1861 Engineer's map of Virvinia. A Blue drop identifies Littleton, VA in Surry County. A yellow pin identifies Thomas Williams and his descendants. A Blue pin identifies Nicholas Williams and his descendants. A purple pin identifies John Williams and his descendants. A green pin identifies Richard Williams and his descendants. These are all sons of John and Ann Williams. Two green men identify wherer John and his probable brother Thomas first lived. 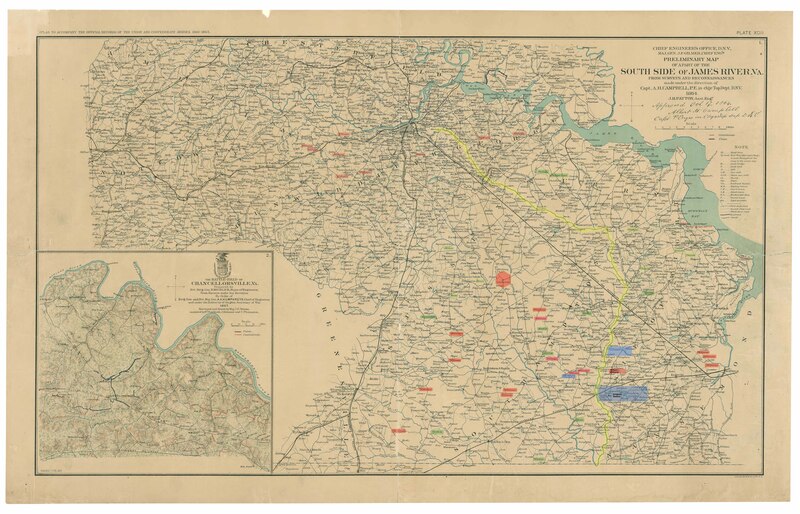 The above Google interactive map was created using Grants and Deeds along with the five maps below plus the indian land maps and the Surry County Patents and Grants maps shown further below on this page. I regard William M. Mann, Jr., the author of the 1961 Mann book on John Williams and his descendants, as the gold standard for research on this family. The below clip from that book indicates the likely birth date of John Williams and his likely brother Lewis along with Lewis' death date and place. JOHN WILLIAMS, born about 1647, Isle of Wight, VA; died about 1692; Married Anne ? It's clear from the various land patents and deeds involving John Williams that most of his children resided around the area of Franklin VA north on the Blackwater river and east above the Nottoway River toward the town of Jerusalem, now known as Courtland VA. Many of the descendants, including some of the children of Richard Williams, my ancestor, moved on to North Carolina and then on further west as time went by. However as late as 1864 a substantial number of Williams continued to reside in this area as shown on the map below which was published by the Chief Engineer's Office, D.N.V. in 1864. According to Dr. Bary Bascom Hayes, Thomas Williams and his purported brother John Williams appear to have lived in the Lawne’s Creek community of Surry and Isle of Wight. John Williams, the oldest son of Thomas Williams, was the first member of this family to move to the Nansemond-Isle of Wight borderlands in 1678, as noted in greater detail below. As also noted in the material about John Williams, the apparent brother of Thomas, they bought 400 acres three years later (10 October 1682) from the prominent speculator George Pierce near John Williams, son of Thomas. Click on this link to view this patent and its transfer to John and Thomas Williams. This purchase is cited in various transactions of their progeny, but none is more descriptive than the conveyance by Thomas Williams’ nephew John Williams “of Albemarle County in North Carolina” to Ralph Vickers of Isle of Wight in 1718—the deed noting that the land was part of the great patent of George Pierce to 2,500 acres in the Corrowaugh-Kingsale area adjacent Colonel Pitt and Colonel Joseph Bridgers as well as Matthew Strickland’s large grant of 1680 and John Moore’s plantation. See the Isle of Wight Great Book, Vol. 2, p. 182; cf. Nugent, Vol. 2, pp. 205, 216-17. Thomas Williams signed his will 28 January 1691; proved 9 August 1693. Click on any of the maps below to open a large map in a separate window. Children of John Williams and Anne ? Click on a child's name to go to more information on this page relating to that child. ELIZABETH WILLIAMS was born about 1672, Isle of Wight, VA; married THOMAS WRIGHT who died about 1701, Isle of Wight, VA.
JOHN WILLIAMS, born about 1674, Isle of Wight, VA; died about Oct 1757, Bertie County, NC; married ANN MOORE. WILLIAM WILLIAMS, born about 1678, Isle of Wight, VA; died about 1712; married MARY Moore based on George Moore will naming grandsons Samuel and John Williams and Williams wife was named Mary and they had sons Samuel and John. NICHOLAS WILLIAMS, born about. 1685, Isle of Wight, VA; died 18 Aug 1749; married ANNE LEWIS. CAPT. RICHARD WILLIAMS, born about 1688, Isle of Wight, VA; died about 1737, Isle of Wight, VA; married SARAH ? about 1710; born about 1688, New Kent. VA; died about 1750, Southampton County, VA. 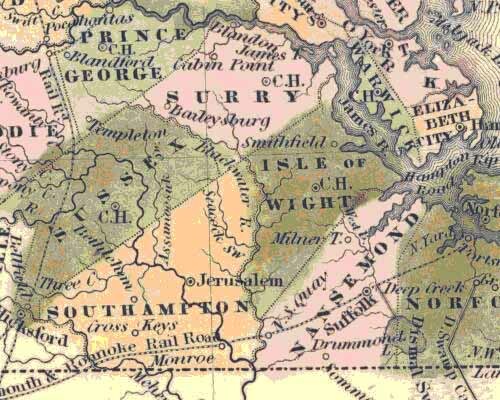 The original name of Isle of Wight county was Warraskoyack and the boundaries of the county of were: Northerly, by Lawnes Creek; Easterly, by James River as far as the plantation of Richard Hayes, formerly John Howard's; the southern boundary by certain creeks to the head of Colonel Pitt's Creek (this proved somewhat uncertain); and westerly into the woods indefinitely. In 1637, the name of the county was changed by an act of the General Assembly to Isle of Wight county. Of course the county was one parish, and the parish was called Warraskoyack; and so it continued to be called until March, 1642-3, when the county was divided into two parishes, to be called, respectively, The Upper Parish and The Lower Parish. The Upper Parish is the gold and blue area on this map while the Lower Parish which was also known as the Newport Parish is the purple and red area. Later the names were changed to Warraskoyack for the Upper and Newport for the Lower Parish. In 1734, the Upper and Lower Parishes were both divided at the Blackwater River. The western portion (shown in gold) of the Upper Parish combined with the southern portion (shown in purple) of the Lower Parish to become Nottoway Parish which became Southampton County when it was formed in 1749. The eastern part (shown in red) of the Lower Parish which was also known as Newport Parish combined with the northern part (shown in blue) of the Upper Parish , the whole of which was then known as Newport Parish, covering the entire Isle of Wight c County court records begin with 1652, when Surry was formed from the part of James City County that lay southwest of James River. In 1732 the portions of the southwestern part of the Isle of Wight and Surry counties that lay below the Nottoway River were added to Brunswick county which had been formed in 1720 from Prince George county. In 1748 the entire county of Southampton was carved out of Isle of Wight county. Southampton county,prior to 1734,was known as the Nottoway Parish of Isle of Wight The Blackwater River continues to flow through the middle of what was the original Isle of Wight County and is now the dividing line between Isle of White and Southampton Counties. The Blackwater River of southeastern Virginia flows from its source near the city of Petersburg, Virginia for about 105 miles (170 km) through the Inner Coastal Plain region of Virginia (part of the Atlantic Coastal Plain). The Blackwater joins the Nottoway River to form the Chowan River, which empties into Albemarle Sound. The Blackwater-Nottoway confluence forms the boundary between Virginia and North Carolina. The Blackwater River is a true blackwater river. Its water is clear, dark, slightly acidic, and tannin stained. Its drainage basin contains many swamps. The river's flood plain is mostly forested and swampy, including bald cypress and tupelo swamp forests. The upper Blackwater River is called Blackwater Swamp. In this region of Virginia, many streams are called "swamps" but still function like streams in being long and linear, with water moving from one end to the other and laid out in a normal stream tributary network. In contrast, some of the region's wetlands are not streams, such as the bog-like pocosins found on the higher land between swamp-stream drainages. 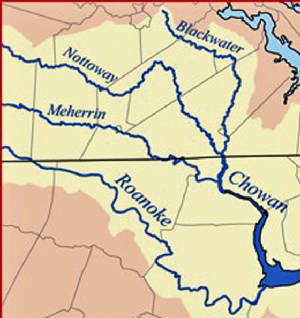 The Blackwater River was a transportation route in the 17th and 18th centuries, connecting the Chesapeake Bay settlements with the Albemarle Settlements. It was one of the few rivers of colonial Virginia that did not empty into Chesapeake Bay yet lay close to the colony's oldest settlements on the James River. 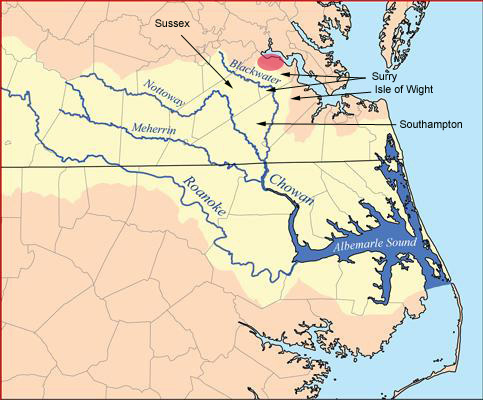 Settlements in the Blackwater's drainage basin were founded very early in Virginia's history. As a result, the Blackwater River became one of the early migration routes southward from the James River into the region then called Southside Virginia, and beyond into the Albemarle District of Carolina (later North Carolina). Today's usual definition of Southside differs somewhat from that of colonial times. In 1781 Greensville county was formed from part of Brunswick county next to Isle of Wight and Sussex counties. Sussex County was formed in 1753 from the part of Surry County that was south of the Blackwater river. Counties is generally the Blackwater River and together they make up the original James City County. The county is thirty-seven miles in length and an average breadth of eleven miles, with an area of about three hundred and fifty square miles. It extends from 36° 38' to 37° 07' north latitude and from 0° 2' to 0° 36' longitude east from Washington. The land dips to the northeast from a plateau a little west of Bethel Church, and from that same plateau it dips to the northwest and west; the former, by many swamps, ravines and creeks, conveys its water to James River; the latter, by the same means, conveys its water to the Blackwater (formerly Indian) River and the Nansemond River. 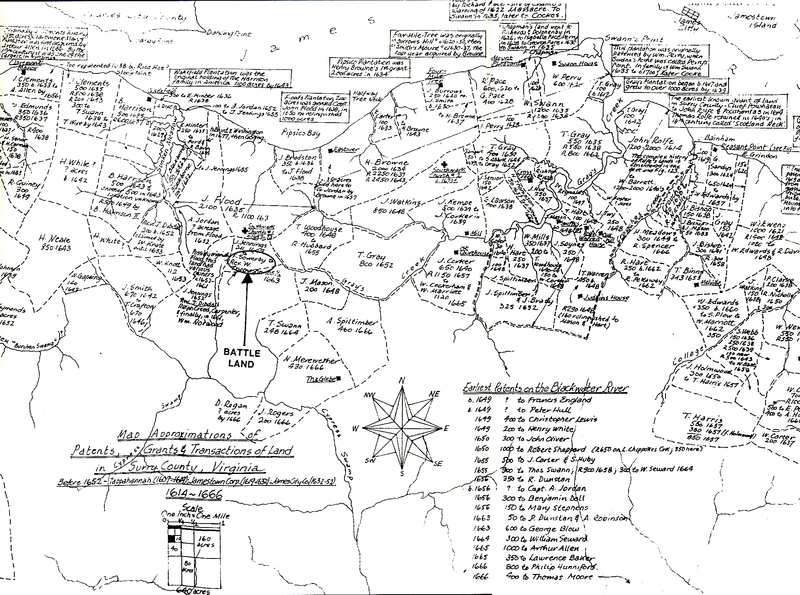 The map below shows the approximate locations of Patents, Grants and Transactions for Surry County VA between 1614 and 1666. Notice the map also contains a list of the earliest patents on the Blackwater River with an arrow pointing from the list downward. The Surry County Patents and Grants map falls in the area indicated by the red oval in the map below. To see a more detailed map of the Patents and Grants in a new window click on the above map. From the earliest settlements south of the James River, the land all the way to what is now North Carolina, was considered part of the Virginia Colony. When James City County was formed in 1632, it included all this land. When Surry county was separated in 1652, it included all the land south of the James River to the present North Carolina border. Before Surry was split from James City, the settlers made the first of many treaties with the Southside Virginia Indians. It appears that the Southside tribes of Indians were relatively weak, and hardly had enough warriors to protect themselves. This treaty provided help from the settlers, should other marauding tribes of Indians attack them. The settlers wanted no Indians to live in the area they had settled. They also wanted information only the Indians could provide on the marauding tribes coming into the area to attack both the local Indians and the settlers. They also needed the trade with the Indians that had been established. The Blackwater River became the dividing line. Indians South, settlers North. This agreement in 1646 settled the Indian War of 1644 - 1646. This treaty between the inhabitants of this colony and Necotowance, King of the Indians settled (temporarily) relations with the Indians. Article 5 of the treaty states "And it is further enacted that neither for the said Necotowance nor any of his people, do frequent come into hunt or make any abode nearer the English Plantations than the lymits of Yapin the black water, and from the head of the black water upon a straite line to the old Monakin Towne, upon such paine and penaltie as aforesaid." Article 8 is quoted "And it is further thought fit and enacted, that upon any occasion of message to the Governor or trade, the said Necotowance and his people the Indians doe repair to Forte Henery alias Appomattuck Forte or to the house of Capt. John Floud, and no other place or places of the south side of the river, at which places the aforesayd badges of striped stuff are to be and remain." Surry County inherited this treaty when it was formed in 1652. It was no problem for the settlers at that time. It took nearly another 50 years before most of the land north of the Blackwater was settled. There were some exceptions to the treaty. Benjamin Harrison purchased 350 acres from the Waynoak Indians in 1686. Others received Patents that did not clearly identify the location. Whether any of these were actually settled is questionable. Likely many were trying to be first in line when the land opened for settlement. By 1700, the restriction on settlement was a problem for the Surry settlers. Surry was fully settled to the Blackwater River, although there still were pockets of unsettled land, mostly smaller parcels of land. There was pressure to change (abandon) the treaty of 1646. Like all their treaties with the Indians, the settlers changed or abandoned them when they got in the way of settlement. Another problem was facing the Surry settlers. The only way to get a Land Patent was with headrights. Each settler coming in to Virginia received the right to 50 acres for himself and any family members or others that they paid for the trip to Virginia. This had worked well in the early years but now there were settlers who had been here for several generations. There was little land available for purchase, and the farm patented several generations ago would not support all of their descendants. In addition, tobacco wore the land out in just a few years. Many of these settlers had accumulated some wealth, mostly by raising tobacco. There was a growing demand to change the Land Patent system to allow payment to receive land patents. The land patent system was changed by April, 1701. The first day patents were allowed to be filed on land south of the Blackwater was April 25, 1701. Patents for 19,918 acres were filed that day, over 31 square miles, and another 16,858 acres later in 1701. Thus over 57 square miles were patented in 1701. The largest patent was 5400 acres and the average acreage was 835 acres, much larger than patents had been north of the Blackwater River. This was America's first land rush. Those with the most land north of the Blackwater got the most to the south. While it did not have the glamor of the west with thousands of settlers racing their horses across the plains, it was much more effective. Most, if not all, were patents to Surry County citizens. Obviously this action was anticipated for years by Thomas Swann, surveyor of Surry County. Surveys for these patents are dated as early as 1695. Swann obviously had surveyed land for his friends years before it was legal to do so. Surry citizens were prepared and ready when the laws changed. There was little or no opportunity for outsiders to get first choice of the land below the Blackwater. Because of these actions, the bloodlines of the settlers of the area below the Blackwater were nearly identical to those north of the Blackwater River. They also took their indentured servants and slaves with them as they settled this southern part of Surry County. In some instances, only the indentured servants and slaves inhabited the land in the first years after the patents were given. Tobacco production also moved south. Soon, little tobacco was raised north of the Blackwater. Later, these settlers repeated this action in later settling Greensville and other Southside Virginia Counties. Soon Virginia was settled to the North Carolina border. With this swift, massive settlement, the area of Surry County south of the Blackwater increased in population very quickly. It took nearly a century to settle Surry south to the Blackwater. By 1728, after 27 years of settlement, there were more settlers south of the Blackwater then in the originally settled area to the north. These new settlers petitioned the Governor to move the courthouse near the center of the counties population. Surry County's court house was moved from near the James River to the land of Howell Edmonds, south of the Blackwater River near or at Shingleton Plantation in 1728. This site is off Rt. 40 just as you cross the Blackwater River and enter present day Sussex County from Surry. This area south of the Blackwater continued to grow in population, while the area north of the Blackwater did not. Completely settled, there was little if any usable land left unsettled north of the Blackwater. In 1754, the part of Surry south of the Blackwater petitioned the Virginia Council to be separated from Surry to form the new Sussex County. It was granted., although the power of the Allens saved little Surry for Surry County. Sussex is south of Surry, just as Sussex is south of Surrey in England. Surry County moved its courthouse back close to the James River at Troopers, while Sussex moved theirs further south, close to Littleton. The following three maps show some of the area on the south side of the Blackwater River and who owned land in that area. You can see in the map above the general location of the area shown in these maps below the Blackwater River and in the counties of Surry and Southampton. It's not clear what time period this map covers, but it had to be after 1701 when patents were issued for the land south of the Blackwater River. The "Indian Land"indicated above is shown in the map below. Landowners include Thomas Williams, probably the son of John Williams, and John Exum who married Elizabeth Kinchen. They were the parents of Sarah Exum who married Capt. Joseph Philips in 1751. They were the parents of Joseph Philips who migrated to Nashville TN in 1791. His daughter, Margaret Peggy Thomas, married Josiah Frederick Wiliams who is John Williams' great grandson. William Kinchen is one of the landowners in the map below and is probably the father of the Sarah Kinchen above who married Capt. Joseph D. Philips. 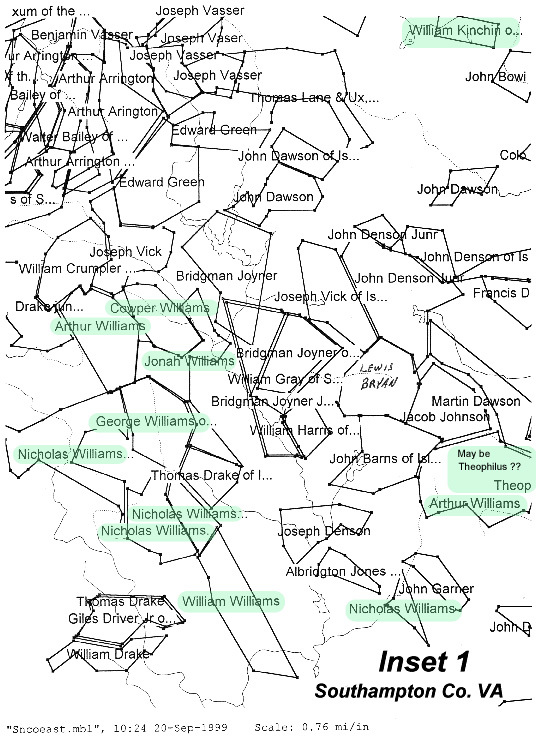 Several Williams are also shown in the map and most are probably sons of John Williams. JOHN WILLIAMS, born about 1647, Isle of Wight, VA; died about 1692; Married Anne? JOHN WILLIAMS, my ancestor, was born about 1647 based on the age of his children as noted in the deed of gift of his wife after he died. He died about 1692 based on his will. He married ANNE ? who was named in his will, although the version transcribed below shows her as "Ann". It does show a grand daughter named "Anne" who is the daughter of Bridget Williams. His wife Anne was born about 1647 based on his assumed birth date. Will of John Williams dated 9 March 1692, probated 9 August, 1692, Isle of Wight Co., VA.
Imprimus I give and bequeath my Soul to almighty God my maker hoping through the merits of Jesus Christ my Saviour to obtain remission for my sins through his death and passion and my body to the earth from whence I came to be decently buried by my beloved wife Ann Williams and my children. Thirdly I give and bequeath unto my son William one parcel of land lying and being in Newport parish which parcel of land contains two hundred acres lying near Meadows which parcel of land my foursaid Sonn William Williams is to enjoy with all appurtenances thereunto belonging to him and the hyers of his body truly begotten. 6th I give and bequeath unto my Sonn Richard Williams and the heirs of his body truly begotten one parcel of land lying and being in Surry County containing one hundred and fifty acres being part of the same tract of land which my aforesaid Sonn John Williams liveth and to him the sayd Richard Williams and the heirs of his body truly begotten with all benefits and appurtenances there unto belonging and after the possession of the same. I and in this my last Will and Testament I do bind charge and command all an every of my Sonns from the eldest to the youngest neither to sell lease or morgage any part or parcell of any of the aforesaid tracts of land by any means but to remain unto them and the heirs of their bodys truly begotten and in case that any of these my Sonns decease without Issue that then that parcell of land to whom it belongs shall be bound to the next surviving heir. his mark Alexander (T) Matthew’s 9th 1692 by the Witness and ordered to be recorded. Anne is the wife of John Williams. Her last name is not known. She was born about 1647 based on the assumed birth date of her husband. son Nicholas Williams his father ‘s musket—Nicholas is 7 years old to have it at 18. Son Richard his father’s sword at 18. Dau. Jane pewter when 18. To dau. Eliza. Wright, Mary and Jane Williams wearing apparel. 9 Api. 1694. John Cram. Arnold Shumarke gives his consent to deed made by his wife when she was in widow hood. May 21, 1694. BRIDGETT WILLIAMS, b. Abt. 1670, Isle of Wight, VA; d. Bef. 1694; Married JOHN BROWNE. John Browne. Sr., and Bridgett, his wife, he sold to Samuel Cannady 220 acres, "the plantation he lately lived on", patented April 29, 1692, ln L. P. Kinsale (Lower Parish, Kinsale Swamp). Wit. Richard Exum, William Murry. DB 2 1704-1715”. Bridgett was the mother of three daughters at the time of the death of her father. Anne, Bridgett and Mary were named in the will of their grandfather John Williams. Bridgett Williams is not named in the will of John Williams she is not mentioned in the Deed of Gift by her mother, Anne Williams, dated 9 April 1694, Isle of Wight County, VA, Deeds. It is likely she had already received her share of John William's Estate at the time of her marriage. She may have been deceased by the date of Anne Williams deed of gift to her other children. ELIZABETH WILLIAMS, b. Abt. 1672, Isle of Wight, VA; m. THOMAS WRIGHT; d. 1701, Isle of Wight, VA. Source: 1961 DECENDANTS OF JOHN WILLIAMS OF ISLE OF WIGHT COUNTY, VA, by William M. Mann, Jr.
Elizabeth was not mentioned in the will of John Williams, but mentioned in the dead of gift made by her mother in 1694 which may indicate that she was a child of Anne's by a former marriage; but her omission from the will of John Williams can be deasily explained by assuming that she was married at the time. Mr. Boddie (Historical Southern Families, p. 217) states that she married Thomas Wright which is almost certainly so as John Williams mentions a mare at Thomas Wright's in his will. The only Wright on the 1704 King William County Quit Rent Roll (of taxable landowners) was a Thomas Wright with 225 acres. She is the Executrix in the will of her husband, Thomas Wright, Jr., dated 23 October 1700, Isle of Wight Co., VA.
JOHN WILLIAMS, b. Abt. 1674, Isle of Wight, VA; d. Abt. Oct 1757, Bertie County, NC; m. ANN MOORE, 1695, Isle of Wight, VA; b. 1675, VA; d. Abt. 1746. ANN JONES was mentioned in her husband's will which he wrote in 1741-42 but did not sign the deed of guift her husband made giving his grandchild, Ezekiel Williams 640 acres 26 February 1757. His will was probated in January 1758 so she probably died between 1741 and 1757. 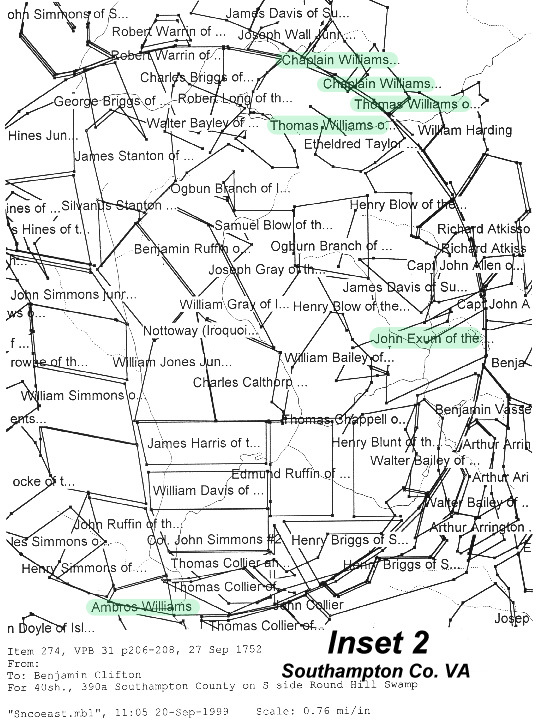 John Williams was born about 1670 in Isle of Wight VA and died abt 1757 in Chowan County NC. 1704: Isle of Wight County Deed Book 1 1688-1704 Reel 2 p. 412-413 John Williams and brother Nicholas witness deed for brother William Williams. 1715: About 1715 he moved to North Carolina. Know all men by these presents yt I LAURENCE SARSON of the Precinct of chowan of the Province afsd for & in Consideracon of the Same of twenty Barrels of Pitch to me in hand pd by Jno WILLIAMS of the sd Precinct of Chowan the receipt whereof I the sd LAURENCE SARSON do hereby acknowledge and thereof Acquitt & Discharge the sd Jno WILLIAMS his Heirs exn admrs forever by these presents Have Given granted bargained Sold Released & confirmed and by these presents do give grant Release & Confirm unto ye sd Jno WILLIAMS his Heirs & Assignes forever One Tract of Land Lying & being in Chowan Precinct afsd & adjoyning upon THOMAS Jones’s Land in Bear Swamp then Runing up the Main Swamp to the Upper Beaver Dam there along a line of Mark’d trees to the sd WILLIAMS’s own Line which appears mine at Large in the Patent & Conteyning Two hundred & twenty Acres more or Less wth all woods ways waters Priviledges Profitts Comidities & appurtences to the Same belong or in any ways appertaining And ye Reversion & Reversions Remainder & Remainders therof. To have and hold all ye afsd tract of Land with all ye Singular appurtenances unto ye sd Jno WILLIAMS his Heirs & Assignes for ever to & for ye only use & hehoof of ye sd Jno WILLIAMS his Heirs & Assignes forever. And I ye sd LAU. SARSON for my self my Heirs exrs & Admrs Do warrant promise & Grant to & with ye sd Jno WILLIAMS his Heirs & Assinges for ever yt I I ye sd LAURENCE SARSON my Heirs Exrs Admrs ye before bargained premises with the appurtenances unto ye sd Jno WILLIAMS heirs & Assignes for ever against all manner of Persons whatsoever shall & will warrant & for ever by these presents defend. In Witness wherof I ye sd LAURENCE SARSON have hereunto sett my hand & Seal this 19th of July 1715. Transcribed by Jean Mayo Hirsch from documents located at the North Carolina State Archives in Raleigh, NC. 1716: He gives his daughter Ann Herron 150 acres in Albemarle county NC. To all persons to whom these presents shall come I JNO. WILLIAMS do send greeting know ye yt the said JNO. WILLIAMS in the county of Albemarle in Chowan in ye Province of North Carolina Weaver for & in Consideration of Love good will & affection which I have & do bear towards my loving Daughter ANN HEARIN of the Same County & Province have given & granted by these presents do fully Clearly & absolutely give and Grant unto the said ANN HEARIN she & her Lawfull Heirs of her own body Lawfully begotten forever one Hundred & fifty acres of Lands whereon the new Giveth beginning in the fork of the Horse Spring branch Johning upon THoS JONES’s Line so up ye Western part of sd branch unto a Maple by the run Side so up a Crooked line to a Pine in the Side of the other branch so runing down the branch to ye first Station. Now if she hath not her due She Shall take it on the Eastern Side of the branch beginning at ThoS JONES’s Corner tree in the branch betwixt the branch & my Pattent Line which runeth partly betwixt me & THOs JONES afsd which Land I give freely to her & her Heirs for ever as afsd. But her husband if he shall pretend to Sell & to Lease it or Mortgage it or Sell any ways make away any timber of Lightwood shall forfeit ye Land afsd as wittness my hand & Seal ye 15th Ober 1716. LAND PURCHASE: - LUKE WHITE to JOHN WILLIAMS, 15 July 1718, ("two hundred and fifty acres of land lying in Chowan Precinct on Chowan River between where the said LUKE WHITE now lives and where THOMAS GRANT now lives...") The deed is then asigned by JOHN WILLIAMS to SAMUEL WOODWARD on 23 day Oct 1718. Witnesses: JOHN SMITH, ROBERT HICKS. Ordered yt the inhabitants on the north side of Bear Creek and those on the west side of Roquist Creek may choose a main road from "New Market" over the head of Kesiah to Sandy Point at ye mouth of Salmon Creek, and yt Robert West, Martin Gardner, William Jones, John Hardy, John Edwards, Charles Barber, and Samuel Herring to be a jury to lay out said road. "Coll. William Maule came into Court and Records his Mark Vizt. a Close Crop in the left [ear ED.] and Two nicks under the right. Granted." "Isaak Hill Esqr. came into Court and Records his Mark Vizt." a square in the upper side of the Right ear and [an?] Under Square in the left." 1724: Witnessed by son Isaac Williams and daughter Ann Williams Herring. 1725: John Williams of North Carolina is selling 125 acres located in Isle of Wight County in Virginia to his brother Nicholas Williams of Isle of Wight, being a part of a tract in a patent Granted to their father Wm Williams bearing date 24 April 1703. This Indenture made this twenty first day of October ye tenth year of ye Reign of our Sovereign Lord George & in ye year of our Lord Christ one thousand seven hundred & twenty five between John Williams of North Carolina of ye one part and Nicholas Williams of the Isle of Wight County in Virginia of ye other part Witnesseth that ye said John Williams for & in consideration of ye sum of 0ne schilling to him in hand paid by ye said Nicholas Williams ye receipt whereof he Doth hereby acknowledged & himself to be there with fully satisfied contented & paid & by these presents Doth acquit & Discharge the said Nicholas Williams his heirs & hath devised Bargained Lett leased and to farm letter and by these presents doth devise bargain Lett lease & to farm Lett unto ye said Nicholas Williams his heirs & assigns all that messuage plantation or parcel of situated lying & being in ye Isle of Wight County in Virginia bounded as followeth, Viz, Beginning at a marked corner tree of John Barnes being a Gum standing by ye Bun side of Nottaway Swamp thence up the Dividing Line to a pine standing by ye side of a branch thence up the Branch to a pine tree standing in Ye said Branch being a Corner tree so up a line of marked trees to ye patent Line & according to Pattent to a marked Red Oak being made a corner tree of the Dividing Line between John Williams & Nicholas Williams from thence down a line of marked trees to Gum standing standing in the Run of a branch so down the branch to a Gum & down a line of marked trees to Gum standing in Nottaway Swamp by the run side being a corner tree from thence down this Run run to a Gum being a Corner Tree standing in the side of ye Run being a Corner tree between John Barnes and John Williams by Estimation one hundred & twenty five acres being ye same more or less which said Land being a part of a tract in a pattent Granted to Wm Williams bearing date ye twenty forth day of April one thousand seven hundred & three & said land together with all houses Orchards Gardens roadways waters water courses & all other profits & advantages to ye same belonging or in any wise appertaining To Have & To Hold the said Devised premises & every part thereof unto ye said Nicholas Williams his heirs & for and during the full term & time of three years fully to be completed & ended yielding & paying for ye same yearly on ye tenth Day of December ye fee rent one ear of Indian Corn if ye same shall be Lawfully Demanded unto Ye said John Williams his heirs & to ye intent & purpose that by virtue of these presents & of ye Statue for Transferring Uses into possessions that ye said Nicholas Williams may be in actual & peaceable possession of ye heretofore granted premises & hereby may be the better enabled to accept of a grant or Conveyance of ye Reversion & Inheritance there of to him & his heirs for ever in Witness where of the said John Williams hath hereunto set his hand & Seal ye Day & year above written. 1727: WITTNESS: B 304--JOHN GRAY TO THEOPHILUS WILLIAMS Aug 8, 1727. 80 pds. 7 sh. for 640 A. on WS Falling Run. Adj. WILLIAM GRAY, JOHN WILLIAMS. Wit: JAMES CASTELAW, SAMUEL WILLIAMS. August Court 1727. *. 1729: Book C p 145- 146 Item 19 Bertie Precinct, North Carolina John Williams is conveying property to his grandson Thomas Castellaw son of James Castellaw and his wife Sarah Williams Castellaw. John Williams is conveying property to his grandson Thomas Castellaw son of James Castellaw and his wife Sarah Williams Castellaw. 1745 - This Arthur Williams is the son of John Williams who is the son of John and Ann. Bertie County July Court 1757. The within Deed of Gift was in open Court duly proved by the oath of Thomas Whitmell an evidence thereto, and in motion was ordered to be registered. North Carolina State Archives in Raleigh, NC. Bertie County July Court 1757. The within Deed of Gift was in open Court duly proved by the oath of Thomas Whitmell an evidence thereto, and in motion was ordered to be registered. To all people to ___ these present shall come known yea that I JOHN WILLIAMS of the Provence of North Carolina in Duplin County for and in consideration of the sum of fourty (40) pounds proclamation money to me in hand paid before the making and delivery hand by SAMUEL SESSOMS of the provence and county above said the receipts whereof and I do hereby acknowledge and myself this with fully satisfied contented paid and with every part and parcel do exonerate do quit and discharge the said SAMUEL SESSOMS his heirs executors administrators or assigns forever One certain m___ or tract of land situate lying and being in the aforesaid county of Duplin and on the East side of Black River on the Beaver Dam Swamp Beginning at a Red Oak on the side of the swamp thence West 179 poles to apine thence W70 wt 179 poles to a pine thence S 20 WE 179 poles to a stake thence S 70 ET 179 poles to the beginning Containing two hundred (200) acres as may appear by the Patent Bearing date the twenty sixth day of May One Thousand Seven Hundred and Fifty Seven 1757 which Patent was granted to FARQUARD CAMPBELL and consigned by deed from FARQUARD CAMPBELL to the aforesaid JOHN WILLIAMS to have and to hold the said granted and bargained ____ with all the appenedents forclosures and compunction to the same belonging ____ to any made appenedents to him the said SAMUEL SESSOMS his heirs executors administrators or assigns forever to him and them only proclamation binds and ____ forever. (unable to read last line of page. 1757: John Williams will was probated. I leave all the rest of my household good monies and Chatels to be Equilly Divided amongst my Children I likewise constitute make and order Arthur Williams and Theophilus Williams & Anne Williams my wife my Sole Executors of this my last will and testament, all and Singular and doo here by utterly disallow Revoke and Disannual all and every other former testaments Wills Legacess and Bequests and Executors by me in any wise before Named willed and bequeathed ____ confirming this and none other to be my last Will and Testament in witness where of I have hereunto Set my hand and Seal this Day and Year Above Written. Bertie County January Court, 1758. The above Written Will was duly proved in open Court by the oath of Thomas Castellaw and of the Suscribing Witness's Thereto which was ordered to be __ ___. WILLIAM WILLIAMS, b. Abt. 1678, Isle of Wight, VA; d. Abt. 1708, Chowan County, NC; m. MARY MOORE, daughter of GEORGE MOORE. Will dated Dec 1704, NC names wife Mary and sons Samuel, John and Stephen. William Williams inherited 200 acres in 1692 adjacent Thomas Mandue from his father John Williams—John’s share of 400 acres purchased by him and his brother Thomas Williams from George Pierce in 1681. The location of the property (shown in the maps below) that William Williams inherited was between the Corrowaugh Swamp and Kingsale Swamp (Shown in red oval highlighted areas in the map below), branches of the Main Blackwater some ten miles south of the Lawne’s Creek community. Further clarifying the location are the patents of Henry Applewhaite and John Williams (30 May 1678); John Moore, # 2 (23 April 1681, adjacent George Pierce and Philip Raiford); Bridgman Joyner and William Mayo (16 April 1683, adjacent Kingsale, the main Blackwater, Hodges Council, Thomas Mann, George Pierce, Henry Applewhaite, John Williams, and Thomas Underwood). Also, John Browne, brother-in-law of William Williams and purported cousin of both Williams’ wife and Dr. Samuel Browne (29 April 1692, south side of Kingsale. See Nugent, Vol. 2, pp. 184, 187, 205, 216, 254, 374; Vol. 3, pp. 4-5. William Williams soon added to his land by becoming one of the early patentees in the Nottoway Basin, west of the Main Blackwater. On 28 October 1702, he patented there 600 acres; other patentees on the same day were James Bryan, Thomas Joyner (whose daughter married Thomas Williams, brother of William Williams), and Thomas Mandue. 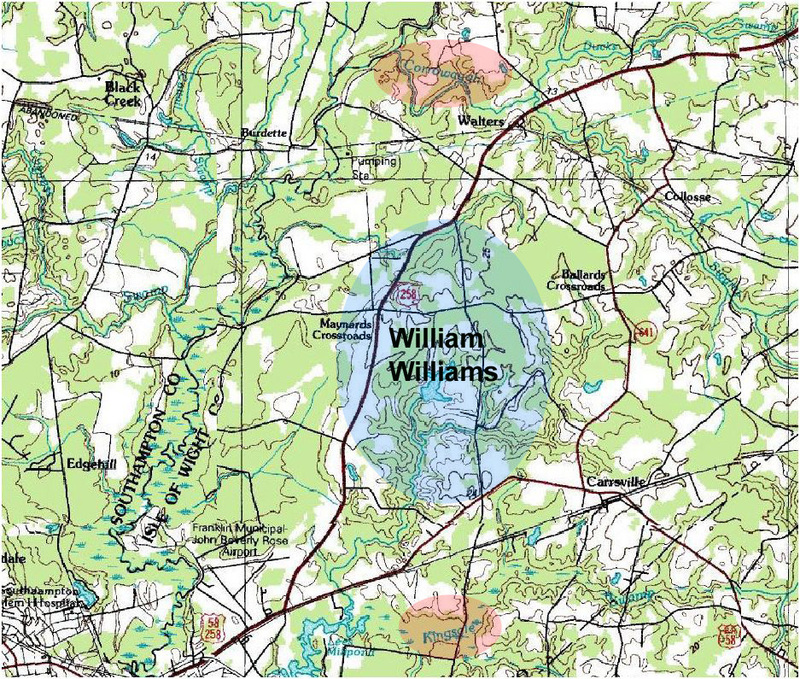 On 24 April 1703, Williams added 400 acres (ibid., 69). The given name of George’s Moore’s daughter, not mentioned in his will, is clarified in a series of six conveyances between October 1702 and April 1704, three of which were to William Williams’ brothers John, Nicholas, and Richard. See Isle of Wight Deed Book # 1, pp. 412-17. See the Williams Section, # 1, a, c, I, and j. The area first settled across the James River from Wiliamsburg is the area at the top of the above map and lies in Surry county. 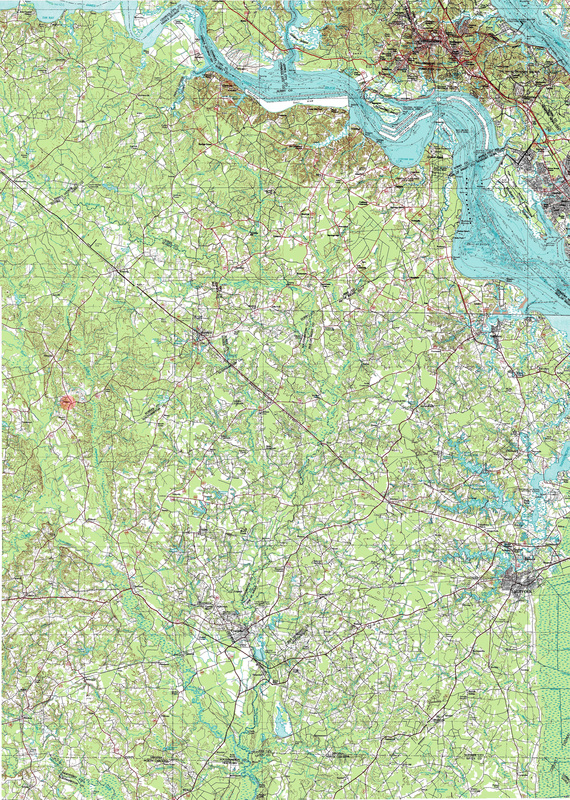 The location of the current Littleton VA town is shown as a small red oval in the left part of the map. This town is and has always been located in Surry County and is not the Little Town owned by the Williams family. The below map is a larger view of the darkened square in the map above. It is just above and to the right of Franklin VA near the Blackwater River in what was called the Newport Parish. The following three maps show the location of early landowners in the area where William Williams lived along the Blackwater river in Isle of Wight. The Seacock, aka Round Hill swamp, lies on the west side of the Blackwater river just above the Carrowaugh swamp which lies on the east side of the Blackwater river. The Beaverdam swamp lies to the east of the Blackwater River just above the Kingsale swamp and northeast of Franklin VA. The Kingsale samp lies to the east of Franklin VA and the Blackwater River. 1694: 9 April 1694, he received 2 cows as a gift from his mother, Anne Williams. [ISLE OF WIGHT COUNTY, VIRGINIA DEEDS, COURT ORDERS, AND GUARDIAN ACCOUNTS; William L. Hopkins; Gen-D-Dex, 1993, p. 47. (Isle of Wight County deeds from 1647-1719, court Orders from 1693-1695, and guardian accounts from 1740-1767]. 1703: April 24, 1703 he received a grant for 400 acres in Isle of Wight County, VA,. 1704: The Quit Rent list of 1704 William Williams ownes 1000 acres of land in Isle of Wight County. Between April 4, 1704 and April 20, 1704, he sold much of his land in Isle of Wight Co., VA in small tracts to Thomas Kirby, John Barnes, John Williams, Nicholas Williams, Richard Williams and Thomas Boone. Where in open Court held for ye Isle of Wight County ye 10 April 1704 by Wm Williams & Mary his wife to be their free Act & Deed, and the said Mary having been examined of her voluntary consent by the relinquishing her right of Dower which is Ordered to be Recorded . 1711: WILL ABSTRACT: Secretary of State, NC Wills, 1663-1789, 09 Dec 1711 15 Apr 1712 Chowan County, N.C: William Williams "of the County of Arbarmale in Chon Gentleman being very sick and week in body but of porfet mind and memory" he made his will...... wife, Mary Williams, given 1/2 of husband's land where he now lives....son, Samuel Williams 1/2 land "whereon I now live"...son, John Williams 175 acres and plantation on southside of Black water commonly known as Litell town...son, Steven Williams 400 acres..each of my daughters, not named. Wife Mary sole Exectrix. Witnesses: Tredell Keefe, Luis Williams, Robert Lanier. Clerk of the Court: Edward Bonwicke..(North Carolina Wills, 1663-1789, Vol. XXXIV, p. 82, Archives, Raleigh, NC.) It is not known how many daughters he had. 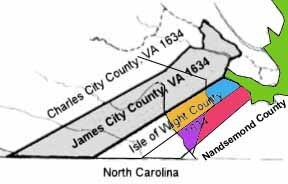 1718: William Willliams son John Williams sells Ralph Vickers of Newport Parish the 200 acres in Newport Parish, Isle of Wight county VA that his father William Willilams inherited from his father, John Williams, and where his father William Williams once lived. Since William Williams' will was probated in Chowan County NC and he is referred to as "of the County of Arbarmale in Chowan", most likely that was where he was living when he made his will in 1711. He left his wife Mary Williams 1/2 of husband's land where he now lives and left the other half to his oldest son Samuel. His son John Williams was left 175 acres and plantation on southside of Blackwater commonly known as Littletown. Isle Of Wight Grant Book Vol 2 1715-1726 p. 283-284 Roll 73 Library of Virginia, Richmond, Virginia [June 2004] 1718: This Indenture made this fourteenth Day of May one thousand seven hundred and Eighteen and in ye fourth year of ye Reign of Our Sovereign Lord George by ye Grace of God of Great Briton France and Ireland King Defender of ye faith & between John Williams of ye County of Albemarle in North Carolina of ye one part and Ralph Vickers of Newport parish in ye County of Isle of Wight on ye other part Witnesseth that ye said John Williams for & in consideration of ye sum of forty Barrels of Tarr to him in hand payed by ye said Ralph Vickers before ye ensealing and delivery of these presents ye Receipt whereof he the said John Williams doth hereby confess and acknowledge and ye said Ralph Vickers his heirs Exe and Agt thereof and of every part there of doth acquitt Exonerate and Discharge by these presents Hath Granted Bargained Sold Enfoffed Released and Confirmed and in any by these presents doth fully and absolutely grant bargain Sell enfooff Release and Confirm unto ye said Ralph Vickers his heirs and assigns forever one certain tract Dividend or parcell of Land in his possible possession none being by force and virtue of a certain indenture of Bargain and sale bearing date two days before ye date hereof and made between ye said John Williams & ye said Ralph Vickers according to the Statute for transferring uses into possession which said land is situate lying and being in ye Isle of Wight County Relation being thereunto hath may more fully and at large appear and bounded as followeth Viz, Beginning near ye plantation whereon William Williams did formerly dwell on ye north end of that survey and so to include ye said plantation with two hundred acres of Land all lying to the North end of ye pattent & here after named and being the full half of a patent of four hundred acres of Land granted to George Pierce by Sir Henry Chickley Knt deputy Governor and Lord General of Virginia bearing Date of ye twenty third of April 1681 and himself ye said Pierce sold to John and Thomas Williams and record made October ye 10th 1681 and also ye Reversion and Reversions Remained or and leases or rents and services thereof To Have and To Hold ye said land & premises with all & singular ye appurtenances thereto belonging or in any wise appertaining unto himself ye said Ralph Vickers his heirs and assigns for ever again to him ye said John Williams his heirs and assigns and against all and every other person and persons whatsoever shall and will ever ___ and forever defend by these presents and ye said John Williams for himself and his heirs Exc & Adm doth covenant promise and grant to and with ye said Ralph Vickers his heirs and assigns and to and with every of ye by these presents and he ye said John Williams now is and at ye time of ye ensealing and delivery hereof shall be lawfully seized of and of ye lands and presents and every part thereof with ye appurtenances without any condition power of Revocation or Limitation of any use or insofar alter change determine or make void ye same and hath good right full power and absolute authority in ye Law to grant bargain sell and confirm ye same and every part thereof unto ye said Ralph Vickers and assigns forever according to ye true intent and meaning of these presents and also ye said Land and premises and every part thereof with ye appurtenances now is and so shall for ever hereafter remain continue and be unto ye said Ralph Vickers his heirs & assigns free and clear and freely and clearly acquitted exonerated and discharged or otherwise upon every reasonable request thereof to be made & sufficiently saved harmless by him ye said John Williams his heirs Exc and adm from all and all manner of form and other gifts grants bargains sales Joynturs Divers use wills __ ____ ________ __and of and from all other estates tyths Troubles Charges and encumberments whatsoever heretofore had and Commuted and or suffored by himself ye sd John Williams his heirs or any other persons Whatsoever In witnesseth whereof ye said John Williams hath here put his hand and seal ye day and date first above written. Thomas Williams, son of John and Ann, or his son has land adjacent the 200 acres of land being sold which is located on the north side of the Nottoway river adjacent Lightwood Swamp. NICHOLAS WILLIAMS, b. Abt. 1685, Isle of Wight, VA; d. 18 Aug 1749; m. ANNE LEWIS. Note in his father's will that Nicholas is seven years old when his father dies about 1692. In 1704 Nicholas' brother William sells his other brother John 125 acres on the south side of the Blackwater River joining John, Nicholas, and John Barnes. which is Ordered to be Recorded. In 1725 Nicholas' brother John sells Nicholas 125 acres on the south side of the Blackwater River joining John, Nicholas, and John Barnes. p715 This Indenture made this twenty first day of October ye tenth year of ye Reign of our Sovereign Lord George & in ye year of our Lord Christ one thousand seven hundred & twenty five between John Williams of North Carolina of ye one part and Nicholas Williams of the Isle of Wight County in Virginia of ye other part Witnesseth that ye said John Williams for & in consideration of ye sum of 0ne schilling to him in hand paid by ye said Nicholas Williams ye receipt whereof he Doth hereby acknowledged & himself to be there with fully satisfied contented & paid & by these presents Doth acquit & Discharge the said Nicholas Williams his heirs & hath devised Bargained Lett leased and to farm letter and by these presents doth devise bargain Lett lease & to farm Lett unto ye said Nicholas Williams his heirs & assigns all that messuage plantation or parcel of situated lying & being in ye Isle of Wight County in Virginia bounded as followeth, Viz, Beginning at a marked corner tree of John Barnes being a Gum standing by ye Bun side of Nottaway Swamp thence up the Dividing Line to a pine standing by ye side of a branch thence up the Branch to a pine tree standing in Ye said Branch being a Corner tree so up a line of marked trees to ye patent Line & according to Pattent to a marked Red Oak being made a corner tree of the Dividing Line between John Williams & Nicholas Williams from thence down a line of marked trees to Gum standing standing in the Run of a branch so down the branch to a Gum & down a line of marked trees to Gum standing in Nottaway Swamp by the run side being a corner tree from thence down this Run run to a Gum being a Corner Tree standing in the side of ye Run being a Corner tree between John Barnes and John Williams by Estimation one hundred & twenty five acres being ye same more or less which said Land being a part of a tract in a pattent Granted to Wm Williams bearing date ye twenty forth day of April one thousand seven hundred & three & said land together with all houses Orchards Gardens roadways waters water courses & all other profits & advantages to ye same belonging or in any wise appertaining To Have & To Hold the said Devised premises & every part thereof unto ye said Nicholas Williams his heirs & for and during the full term & time of three years fully to be completed & ended yielding & paying for ye same yearly on ye tenth Day of December ye fee rent one ear of Indian Corn if ye same shall be Lawfully Demanded unto Ye said John Williams his heirs & to ye intent & purpose that by virtue of these presents & of ye Statue for Transferring Uses into possessions that ye said Nicholas Williams may be in actual & peaceable possession of ye heretofore granted premises & hereby may be the better enabled to accept of a grant or Conveyance of ye Reversion & Inheritance there of to him & his heirs for ever in Witness where of the said John Williams hath hereunto set his hand & Seal ye Day & year above written. In 1744 Nicholas and Anne William file a deed of gift to their children William, Nicholas, Jacob, Johah, Lazarus, Richard, Benjamin, Patience, Sarah, and Mary. [I. of W. D. B. 6-38]. Benjamin Williams, son of Nicholas and grandson of John and Ann Williams, witnesses a sale of 150 acres at the fork of Black Creek and Blackwater Swamp adjacent Joshua Whitney also witnessed by John Joyner who we know lives just below this property. This land is just across the Blackwater from Willliam Williams and above the Williams shown on the Southside of James River map published in 1864 by the Chief Engineer's office, D.N.V. Benjamin Williams, son of Nicholas and grandson of John and Ann, signed the fillowing deed as a witness. It is located next to the above deed witnessed by Nicholas. b. Abt. 1688, New Kent. VA; d. Abt. 1750, Southampton County, VA. based on husband's birth date. In 1704 Richard's brother William sells him 130 acres of land on the south side of the Blackwater River. The following was copied from the book Descendants of John Williams of Isle of Wight Count, Virginia by William M. Mann, Jr., Christmas, 1961. "Also, on April 10, 1704 he was one of the witnesses to a deed, William Williams and wife Mary to Richard Williams (q.v.) and it is unlikely that he was younger than 15 or 16 years old at that time." Besides being mentioned in the will of his father, John Williams, and the deed of gift made by his mother, Anne Williams shortly before her marriage to Arnold Shewmake, the following records which have been abstracted have been found which pertain to Richard Williams. It is seen from the above records that Richard Williams, son of John and Anne Williams, owned considerable land in Isle of Wight, later Southampton County, Va. And that this land descended to his grandson, Richard Williams, son of John Williams, who married Lydia ? and who over a period of about 16 years sold it. The above deed besides showing the frugal nature of Richard Williams shows a man of some importance in his community fo here he appears as “Capt. Richard Williams: which doubtlessly means that he was a captain in the militia of his county, a very important position in that day. In summary, a number of things can be stated concerning Richard Williams, son of John and Anne Williams. He was born about 1688 and in 1704 he was deeded his first tract of land, it being deeded to him by William Williams who can be identified as his brother. He was still a minor at that time and the consideration he used for the purchase of the land apparently came from the accumulation of this income from his father’s estate. He was granted several tracts of land which came to lie in Southampton County, Virginia after that county was formed from Isle of Wight. He also owned land in Nansemond County, Va. Besides being a person who apparently had a frugal nature he was also of some importance in the community, having been a captain in the militia as proved by his being called “Capt. Richard Williams” in the only deed found showing his disposing of any of his land. He died in 1727-38. He married about 1710, Sarah ?, whose family name is still unknown and who died in Southampton County, V. in 1749-50. The name of the community if not the name of his plantation was “Littletown” as proved by the will of Sarah Williams, his widow, and a deed by their grandson, Richard Williams. In the will of Richard Williams no daughter Elizabeth is mentioned. However, she is mentioned in her mother’s will as daughter, and in the will of her brother, Elisha Williams, she is called “sister”. Forthermore, in the will of Elizabeth (Williams) Daughtrey she mentions her “brother” Elisha Wiliams. Her omission from the will of her father, Richard Williams, means that she was married at the time of his death and probably had been provided for as was the custom at that time.